She's gone, she's gone now... 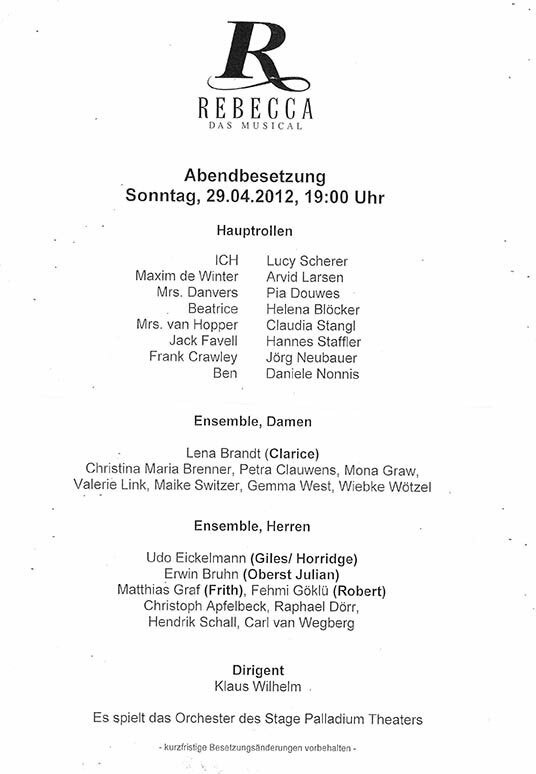 But before that, everyone let it rip one more time at Lucy's officially last show on April 29th 2012. While her colleagues built small gags into the show, the audience celebrated every song with extra-long applause. During the last song the entire audience was waving blue snap-light-sticks, then flowers were thrown onto the stage. 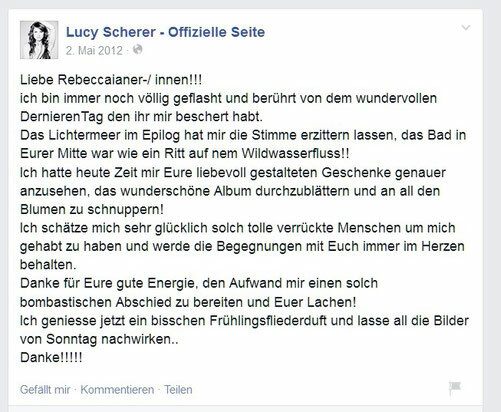 Sie‘s fort, sie‘s fort jetzt … Doch davor gaben alle noch einmal richtig Gas, bei Lucy’s offiziell letzter Show am 29.4.2012. Während ihre Kollegen kleine Gags in die Vorstellung einbauten, feierte das Publikum jeden Song mit überlangem Applaus. Zum Schluss schwenkten alle Zuschauer blaue Knicklichter, und Blumen segelten auf die Bühne. How many of Lucy's fans and Jemmalings were actually present, was really made obvious later at the stage door. A huge crowd waited at the back of the Palladium Theater and welcomed a slightly overwhelmed Ex-"I" with a flurry of flash bulbs and deafening applause. Awesome. Just awesome. Or as Lucy said so fittingly: "You are crazy, totally crazy! But I like it...!" 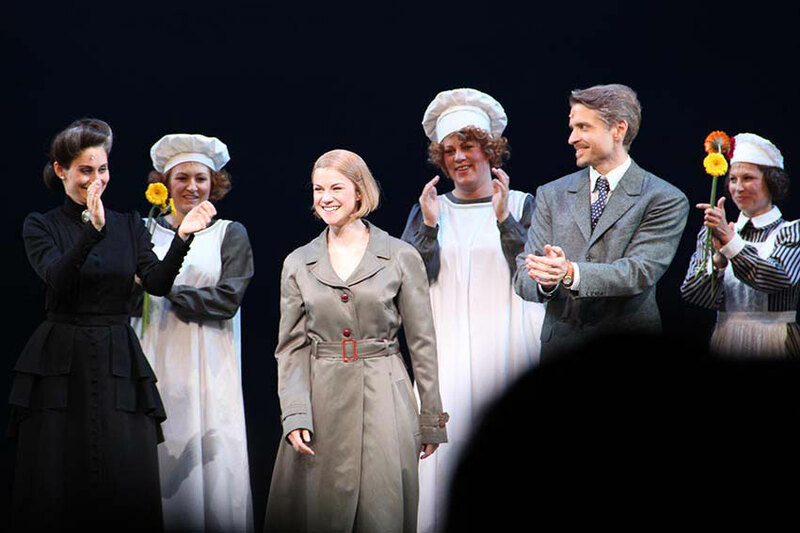 Here are two Vids from the Stage Stoor after a fabulous, last Rebecca Show. Thanks Lucy for the last couple of months! I'm still completely blown away and deeply touched that you gifted me with such a wonderful day of my last show. The sea of light during the epilogue made my voice tremble , the bath in your midst was like a ride on a wild-water river!! I had the time today to look through your presents, to leaf through the beautiful album and to smell all the flowers! I'm very lucky to have had such great, crazy people around me and I will keep my encounters with you always in my heart. Thank you for your positive energy, all the effort of creating such a bombastic good-bye for me, and your laughter! Now I'm going to enjoy spring's lilac scent for a bit and let all of Sunday's images go running through my mind... Thank you!!! She's gone, she's gone now - that wasn't completely accurate, by the way. 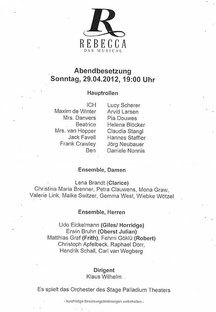 In June 2012, Lucy returned to Stuttgart for a few shows, and on December 1st 2012 she took over the role of "I" in St. Gallen Theater in Switzerland for one show. Sie’s fort, sie’s fort jetzt – das stimmte übrigens nicht ganz. 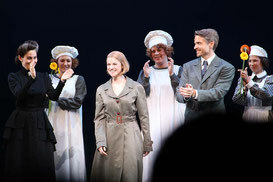 Im Juni 2012 kehrte Lucy noch einmal für einige Vorstellungen zurück nach Stuttgart und schlüpfte am 01.12.12 auch im Theater St. Gallen in der Schweiz für eine REBECCA-Vorstellung in die Rolle der „Ich“.